In industrial settings when gasses are stored under pressure in liquefied form, they are stored in tanks, cylinders, or dewars. As the gas is needed for use, the liquid is boiled off and released as gas through a valve that allows it to be channeled to a given area. The remaining contents stay in the container as liquid until the process is repeated. In order to calculate correct refill and replacement within the tank, one needs to know the amount of liquid gas left inside. This is accomplished by measuring the flow rate via the change of weight that occurs over a specific amount of time. This weight then determines when the tank is running out of gas. Cylinder scales are designed to accommodate a wide range of liquefied gases and relay weight information to a central area for monitoring. One way this happens is through Internet connection that flawlessly sends data for immediate and accurate readings. 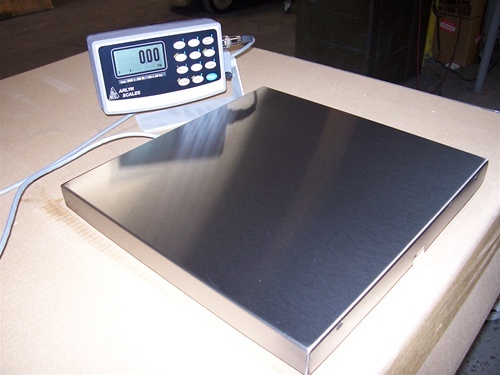 Most ordinary electronic scales in use in the market can handle up to 300 pounds of weight. Larger tanks require larger platforms, most specifically those that can handle up to 3,000 or 5,000 pounds at a time. In order to get an accurate reading on these large weights, load cells are put into play. These are electromechanical devices created to convert weight into the electrical signal. To be even more exact, a load cell is a transducer that is able to convert force into a measurable electrical output to determine refilling procedure. When only one load cell is used it generally relies on mechanical bearings to position the weight on the scale so that a proper reading can be made. But these bearings are prone to wear and corrosion, which compromises their accuracy over time. The use of one load cell is generally for lighter weight as well as for keeping costs low, as they are less expensive to produce. In order to keep a load in place, rollers and edges are often required. This position, however, can be difficult to maintain if the right amount of load cells are not used. Two load cells can help create more balance, but still do not provide the ultimate accuracy that is ideal for weighing protocols. The most common type of weighing system used when it comes to cylinder scales is through the use of strain gage load cells, where the resolution amounts to one part in 5,000. The majority of this type of load cell is made of aluminum, which is inexpensive and easier to mold into whatever shape necessary. High-end scales employing strain gage load cells use plated steel. At Arlyn Scales, we only use stainless steel, which is durable, rugged, easy to clean, and designed for longevity. A secondary technology for weighing cylinder tanks is called either Force restoration or Force motor. Here, the principal of electromagnetic force opposing weight on a scale platform is used. In this scenario, there is a higher resolution and accuracy than found in the strain gage load cells, but there is also some temperature instability and drift. Force restoration scales are more difficult to use in scales designed to handle fifty pounds or more, and are often damaged due to shock loading and overload. These weighing systems are additionally more expensive to manufacture than the strain gage model. Arlyn Scales has developed a third technology called Surface Acoustic Wave , or SAW. Using a similar technology that is found in the fabrication of semi-conductor integrated circuits, SAW produces a highly precise digital output with ideal resolution and accuracy unparalleled in the weighing industry. With this revolutionary technology, there is greater temperature stability and an extremely high tolerance to shock and overload due to the integration of a very rigid load cell block. Able to handle capacities up to 5000 pounds, this system is twenty times as accurate as the strain gage system, at less than one third of the cost of equivalent force restoration scales. When it comes to the advancement of providing accurate measurements for any type of weight system, Arlyn Scales is superior to all of its competitors. Instead of relying on two load cells, we put one load cell in each corner of a scale platform, which means there are four load cells on every unit. This means that the entire system is designed to be completely electronic, with no pivots or bearings needed for extra stability or positioning. As a result, there are no moving parts that can be damaged. Unlike many weighing systems that are made from aluminum or nickel-plated steel, which can deteriorate in corrosive environments, ours are made of stainless steel. This means resistance to fumes, damaging liquids, moisture, and water vapor. Using a special alloy of heat-treated stainless, our machines boast a durability and longevity not found anywhere else in the industrial scale marketplace. Using four load cells also allows gas cylinders and tanks to be placed anywhere on a platform, with no compromise to the accuracy of a weight reading. These rugged cells provide everything necessary for the most precise transmission of information when it comes to calculation and refill. Another essential area to look at is the scale platform itself. Many of Arlyn Scales competitors manufacture them from steel that they coat with specific kinds of paint to protect them from corrosion. There are also a number of plastic versions that are employed for weighing purposes. In both cases, any exposed metal components will corrode, thus interfering with the electronic signals that are essential to the weighing and transmission process. Our scales are shielded from both electromagnetic and radio frequency interference due to our unequivocal use of stainless steel. Whether you need weighing systems that employ load cells for commercial, laboratory, or medical applications, Arlyn Scales has the most evolved and state-of-the-art systems in the marketplace today. For more information on what we can offer or fabricate for you, please contact us via our online form or by calling 800.645.4301.